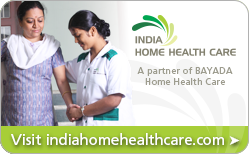 BAYADA Home Health Care is proud to announce our partnership with India Home Health Care Pvt. Ltd. (IHHC), a leading home health care service provider throughout Chennai and Bangalore. This exciting, new partnership will allow IHHC to support Non-Resident Indians with aging or ill parents in India. “We are very happy to have found BAYADA, a company that has provided exceptional care for people in their homes for more than 35 years. It will be great for the clients in India to be able to benefit from that expertise. As the home healthcare industry in India is still developing, BAYADA will help us to succeed,” said Mr. Frank Goller, Director with India Home Health Care. India Home Health Care was incorporated in 2009 to provide quality care to clients in their own homes. With state of the art protocols and processes IHHC was able to grow to become the preferred home healthcare provider to all major hospitals in the cities they serve. BAYADA Home Health Care will support the expansion of India Home Health Care into new geographical regions throughout India, as well as help to increase the IHHC footprint of existing offices. Founded and managed by a proven and professional team of health care experts, IHHC has established a strong base with over 600 referral partners, building strategic relationships with many of the largest specialty hospitals. Providing quality care to clients in their own homes since 2009, today we serve hundreds of people monthly, through state of the art processes, with a focus on the individual. Ensuring continuous quality care, India Home Health Care has become the trusted partner for home care services to all major hospital groups and physicians. A physician with over 12 years of both clinical and management experience in the health care industry and a strong background in health care operations, Dr. Anitha has a Masters in Health Finance and Management from John Hopkins Bloomberg School of Public Health, Baltimore, USA. If you are a Non-Resident Indian living in the United States with aging or ill parents in India, learn more about how they might benefit from home care services by visiting India Home Health Care.